You may like to announce the death and funeral details in a newspaper or publications. The body of the person who has died needs to be transported to the cemetery or crematorium in a suitable coffin that shows the person’s name and age. There are many different types of coffin to choose from, varying in cost and style. You may also like to consider options that have less impact on the environment. There are stricter rules on coffins that are suitable for cremation, please be aware that currently two coffin accreditation schemes exist, managed independently by the Funeral Furnishing Manufacturers Association (FFMA) and The Coffin, Casket and Shroud Association (CCSA). The schemes help to ensure that coffins brought for cremations are fit for purpose and cause no problems to cremation authorities, funeral directors or bereaved people. If you're using a funeral director, they will assist you with this choice. However if you're organising a funeral yourself, we can provide a simple, suitable coffin to minimise costs. Contact us for information about this. You may want a following limousine for the family or if preferred, they can use their own vehicles. The coffin and body are usually carried by four to six bearers, or the coffin can be wheeled into our chapels if required. The bearers are usually provided by the nominated funeral director, or friends and family can be nominated to help if appropriate. Those preparing to act as a pallbearer may need to consider how they feel, physically and emotionally and if this may be too difficult for them on the day. Often friends and family like to buy flowers or wreaths to lay on the coffin. You can ask for flowers to be a certain colour or type (those favoured by the person who has died) or you may ask for a donation to a specified charity rather than money spent on flowers. special jewellery to be left on the person who has died. Before the body of the person who has died is taken to the crematorium or place of burial you may like to hold a service in their honour. This can be in the chapel of the cemetery or another suitable place such as a place of worship, or community space. If this is for a burial, a service can take place in one of our three chapels (Lambeth, Streatham and West Norwood) or if you prefer, this can be held outdoors at the graveside. Decide whether the service is open to all or if you want to invite a certain group of people and how you will make the details of the funeral known. an address about the person who has died (eulogy). You may have a minister, humanist officiate or person in mind to take the service or this can be a friend or relative if desired. After the service the body is either cremated or buried. 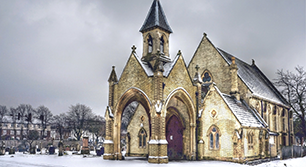 If the service is in a different place to the crematorium or place of burial, a short committal ceremony will normally occur at the crematorium or place of burial, which can be quite brief. We're here to provide you with sensitive and professional support to help you organise your chosen funerals. 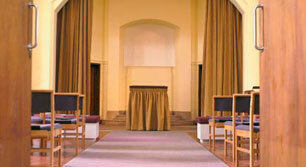 Our cemeteries and crematoriums offer a beautiful and calm place in which to hold a funeral service. This can be in the crematorium, a cemetery chapel or as a grave side service. We only offer new graves at Lambeth and Streatham cemeteries. Cremation is the most popular choice when arranging the funeral of a loved one. 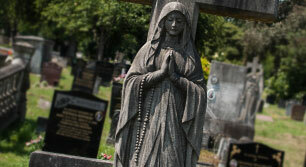 View the costs for burials and cremations at our cemeteries and crematoriums.